A fantastic looking traditional appliance, the Oster Beehive blender really draws your attention when you enter the room. Boasting a slick retro design this classic blender is not just visually stunning, it’s a top blender that gets the job done swiftly and effectively. Not only is this contemporary Oster Beehive Blender within reach of everyone’s budget, but it’s easy to use and will do almost everything a more expensive blender will do and do the job well. Osters classic chrome beehive finish. An all-metal drive system for long durability. Powerful 500 or 600 watt motors. All have stainless steel Ice blades. 2 Speed Toggle control and Pulse. Dishwasher safe glass jar is thermal shock tested for extreme temperatures. Removable filler cap for simple measuring and filling. Measures -Approx16 inches High x 11 inches Wide x 9 inches deep. Weighs – Approx 9 lbs. 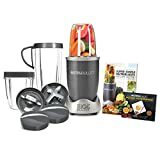 A powerful 500 watt motor comes with this awesome blender together with a great ice crusher that’s ideal for those warm summer months, when you really need that little something to to quench a thirst. The Osterizer blender is strong enough for all your blending needs, such as preparing a pot of soup, or making gravies and salsas. Utilizing the toggle button you are able to alter the speed of this blender to be sure of the correct consistency each and every time. The blender is finished off with a five cup glass jug that is dish washer safe and also scratch-resistant. The affordable price point also ensures that this quality Oster Beehive blender is within reach of everyone’s budget. It’s also easy to use and will do almost everything a more expensive blender will do and do the job well. One of the biggest advantages of the Beehive Blender is that it comes with a great ice crusher blade which can provide you with flawlessly crushed snow each and every time. The blade is constructed from stainless-steel, and this means that it will not rust. This will make it super easy to clean up and keep it razor-sharp to deal with the hardest food items. If you’re searching for perfectly chopped foods then this blenders pulse feature will also give you the essential control required to minimise any mistakes with excess chopping. Another benefit with this blender is its proficiency at grinding coffee and cocoa beans, crushing ice, and even chopping up almonds and walnuts with ease. Numerous alternative blenders are known to get too hot in the course of challenging jobs like these. And with some units you can even split gears inside the motor. I’ve been asked that question dozens of times from visitors to BlenderExpert.com, and up to now I haven’t been able to give a solid, honest answer. So I figured it would be time to do a little digging and find out more. Over the last 20 years or so Oster has continuously launched new models of their Beehive blender to the point that it’s all become a little confusing. Basically, as far as I can tell they are all made with the same motor and workings. The manufacturing methods have changed over the years and parts within the base have changed, but from new all models come with the same parts. They were probably made a little better in the past, but what appliance wasn’t… Right? The only real deference between models is that some have different designs of the glass pitcher and paint finishes. Having said that there are two slightly older ‘Classic’ designs that have stood the test of time and are still being manufactured by Oster. To this day the Chrome 4093 and the Designer Series 4096 are selling very well and garnering excellent consumer reviews. Now for me, that’s a quality signal we should all take note of… There’s no smoke without fire, right? These two blenders both start with the same model number 4, where most of the new models start with a 6. Alongside those two you also have one other choice that I would go for in the 4 series. This one is not being manufactured anymore, but at the time of my writing it can still be found online. I’m mentioning it only because it is great value for money. The Oster 4125 is a 6 Piece Kitchen Center; you get four attachments included in this deal for the great price of around $110. The extras include a stainless steel jar, a food processor attachment, a mini jar for grinding and storage plus a milkshake blade that makes great frothy drinks. If you want the attachments but you can’t get hold of the 4125 anymore don’t worry. All of them can be purchased separately (around $60 in total). All you have to do is a quick search for each on our kitchen blender parts store. Amongst the latest Oster Beehive blenders I would also recommend the BPCT02 Model. This is the latest version of what was one of the most popular Beehives the BPST02 Professional Series. It’s a Toggle Beehive blender that doesn’t disappoint when it comes to style, functionality, durability, or affordability. 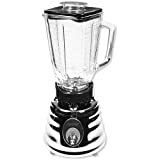 There are many other blenders on the market that compete with this one but few have the combination it would take to come out ahead of it on price. The Oster Beehive Blender review wouldn’t be exhaustive unless we took a serious look at any reported disadvantages of the machine. The only real negative that we could find is that this blender is said to be fairly loud. Having noted that, most users agree that with such power a certain amount of noise is inevitable, particularly throughout the tougher blending tasks. Some people are put off by the idea that the Oster Beehive blender has only two speeds, until they realize they never actually use more than full speed and pulse, even if the unit they are using has multiple options. One other documented problem could be with the blender lid. This can sometimes have a propensity to change shape over time and become loose. I would say that it will probably take a lot of blending hours for this problem to surface. And as it’s possible to buy a replacement Oster blender lid for around $4, the solution to this problem will not break the bank. In fact, if you are at this stage it makes sense to go ahead and purchase the Oster blender refresh kit which you can get for under $10 right now. 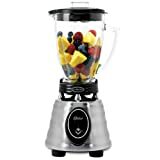 This Oster Beehive blender has received a very good percentage of five star ratings on Amazon, scoring 185 from a total of around 387 reviews, and averages 4 stars overall. This Oster Beehive blender has received 43 five star ratings on Amazon from a total of around 89 reviews, and averages 4 stars overall. Despite a few complaints regarding the Oster Classic Beehive blender, overall most consumers are thoroughly pleased with their purchase. The Beehive Blender is a great looking contemporary and classic blender that will look fantastic in anyone’s kitchen. It can fit easily into any kitchen cupboards you might have and the sleek, retro design will catch the eye. The blender is tagged with a reasonable price considering it can deal with nuts and coffee beans, potentially saving you money on the purchase of a separate coffee grinder. If you are on the lookout for a blender that will match up to any blending, chopping or mixing task in the kitchen then put this Osterizer blender on your list of blenders to look at. It will complement your kitchen beautifully no matter what style you have. Thank you for this review. I’m looking into getting my son something as he just moved out to go to college. I was thinking the magic bullet like what I have but the cup nibs all broke off. I have been reading reviews on the magic bullet on amazon and someone said to check into the Oster Beehive (but I don’t see it as Beehive on Oster’s website). Do you have a recommendation for what I should get him? Some of the other blenders you have pop up on your site have -1%, -8%, -11%, -15%, -17%. What does that mean? On your sidebar it also mentions the shark/ninja. how you’d you compare that to the Oster?